Here is a little wrap up of my thesis I just delivered. There is an increased discussion in the news worldwide that people today suffer from health consequences that can be traced back to wrong food consumption. The food consumption many people are used to is on one hand adapted to fit our busy lives and on the other hand promoted by a food industry that tries to maximize profits and increase sales. Especially in Finland, the grocery trade business is organized around making people buy processed, ready made meals. In contrast to this there is a rising trend of slow living, meaning that people try to decrease speed of life and put more attention to the lifestyle we used to have before life got optimized for efficiency: home grown food, hand prepared and consumed with enjoyment and time. Customers start demanding more transparency, variety and focus on health in the food they consume. Against this backdrop the question arises whether supermarkets in the future should play an active role in educating their customers in a healthy nutrition and take responsibility for their customer’s wellbeing with regards to food consumption. This gap between changing customer needs and the lack of health supporting services in the grocery trade represents the opportunity for this thesis. The aim of the thesis was to develop a new service concept for the Finnish grocery trade, which encourages supermarket customers to choose healthier and sustainable food. There are three main theoretical discussions that build the relevant base for the context of the report. The thesis first looks at what a service concept is and how service concept is has been discussed in the academe. The thesis shows that there is no unified accepted definition of the term but the reviewed literature suggests a few common characteristics. The service concept communicates the customer benefit or value of a service idea to stakeholders, employees or customers and should include information about brand and marketing, highlight the strategic intent of the organization, specify the experience the customer receives and describe operational tasks and activities. To make the service concept definition tangible and usable for the context of service design, I mapped service design tools to the characteristics of the service concept. These tools make up the service concept developed in the empirical part of the thesis. In ‘Designing for the grocery trade’ the thesis explores what kind of aspects are relevant when developing new services that deal with food and consumption behavior in supermarket environments. Influencing people’s behavior towards positive change is a challenging task and research suggests that within the context of nutrition supermarket interventions and games have been successful approaches. There are many trends that suggest that changes in customer behavior is changing the way supermarket will function in the future and that business need to react to these in order to stay on the market. Finally ‘Transformative Services’ as the third theoretical base looks at the concept of services that intent to change the behavior of individuals or groups in order to foster wellbeing among them. Even though research in this area is still limited and recent, there seems to be a common notion that transformative services are considered a way for service business to survive in challenging times of market saturation and lack of differentiation. 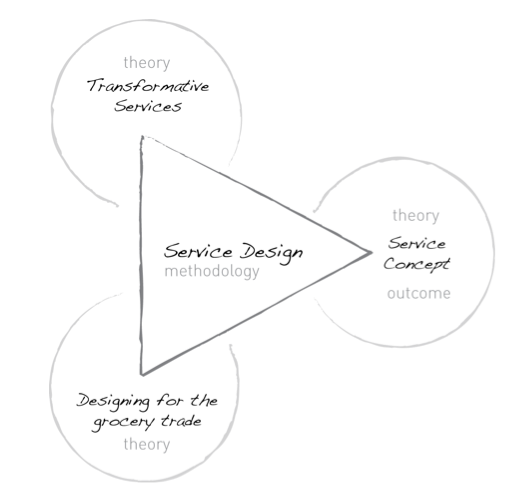 In order to make the theory of transformative services tangible for the use of developing a service concept, I point out eight ingredients that add transformative character to services.